WordPress is an open source website development technology. It is written in PHP and MySQL languages. WordPress is used by many small and big enterprises to develop websites. WordPress makes it easy for entrepreneurs to modify, change, edit or update the contents of their site in an effective way. Let’s we discuss WordPress developer key skills and how to become an expert WordPress developer. This robust system allows you to create a website based on your business needs. To create one such website, we shall quickly explore some of the WordPress developer skills that you should acquire. Here are the 10 WordPress developer skills that required to top your skills in WordPress development. 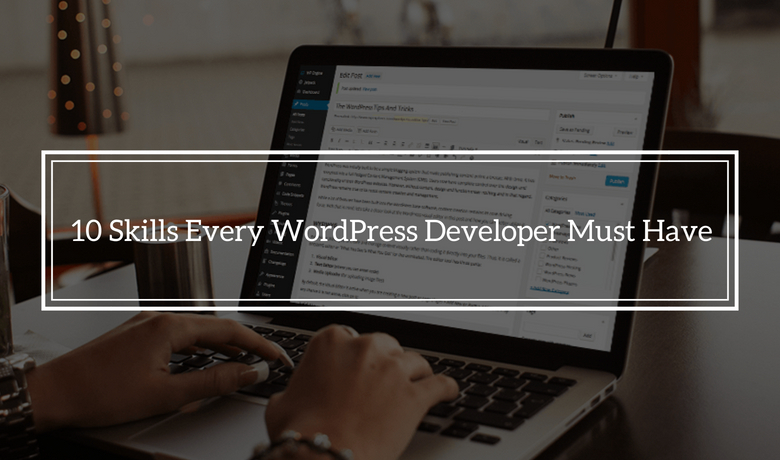 Let’s take a dive into the Key Skills of WordPress Developer. Planning is the hallmark of every successful developer. It is the usual tendency of developers to start working on their creations without chalking out a plan. While this mettle of theirs’ is appreciated, at the same time, moving ahead without a plan can cause serious repercussions. They need to think on the lines of, will the new project interfere with any existing projects? Do you have a deadline in mind? Is that deadline feasible? Do you have the necessary tools in hand to complete it? What will you do when the plugin or theme is completed? Will you offer it for free or as a premium option? These ruminations will enable you to start afresh all your projects. It is good to move forward by coming up with deadlines for your goals. Breaking down large tasks into smaller workable ones will enable you to boost your productivity and give more attention to your tasks. At the end of the day, start planning even for your launching. Think about stuff like, online pricing and other offers. You can think of design aspects: How should a modern web design look like? Are blinking website elements still as cool as they were during the heyday of Myspace? Is responsive design really necessary? Criss-cross on technological aspects: The adoption of CSS3 and HTML5 make things possible that weren’t a few years ago, which is awesome! At the same time, however, the lack of universal support has to be taken into account during development. Ponder on security aspects: The wide adoptions in WordPress for building websites also means that more and more people target these site with malicious intent. Therefore, an awareness of security concerns is crucial. Be a constant learner. Be gripped with the status quo and future developments. Keep upskilling. The very idea of marketing is shunned by many. Many often view it as a persuasive way of stuffing products on an individual. It need not be that way always. As a WordPress developer marketing is very important to introduce yourself and your brand to the world. There are many who would show genuine interest in your offer. Marketing also enables you to understand your customers and their needs better. Thus they become more appreciative of you. Knowledge of your customers in order to sell your products is very essential. Therefore, honing your skills in marketing as in programming will widen your reach. Delegation will seem to be an indigestible word for those “stand alones”. You tend to operate yourself and others the way you think is right. But as a developer ,you need to be collaborative. You need to delegate things. You cannot take up all roles individually. Collaborative efforts hasten processes with utmost efficiency. This is the real winning situation. It makes you move forward. Collaborative delegation is a skill that has to be mastered. It is not mandatory that every project becomes a success. Don’t waste your time on projects that have already gone up in flames. It is also a waste of resources. The time you invest on dead projects can be expedited on implementing themes and plugins. Learn when to have a grip over things and when to let go. A stalwart like Steve Jobs went on asking for feedbacks while developing his product. He also used to show prototype of his devices to neighbors and asked them to opine on it. We need to nurture this essential quality. Thoroughly testing before shipping is crucial for a WordPress developer. In case you write codes, make sure it works on different browsers and operating systems. Ask feedbacks regarding your themes and plugins. Feedbacks will evade succumbing to “tunnel vision”. Learn to cope up with and wisely manage negative comments. Learn to be a developer who works with passion. Love the job you do. Enthusiasm and vision are trademarks of creative developers. Clearly, define for yourself a trait and be conscious of it. Define what is your liking for, is it the creative process or working with clients or just giving back to the WordPress community. Strike your deal. Your clients will keep coming back to you if they are satisfied with your responsible responses. As a WordPress professional it is important you push your abilities to bring about optimal creations. At the same time, you should realize that there exists a vast scope of learning and that your knowledge is always limited. WordPress offers wide range of fields, from plugins to themes and frontend design to eCommerce. Its scope of development is ever-evolving. This necessitates different specialized knowledge. As a WordPress developer, you should know when to use your specialized skills and when to employ broad skills. You should be able to focus and avoid distractions in order to achieve the desired perfection in web development. Procrastinations will ill-favour your progress in web development. As mentioned above WordPress utility keeps evolving. The core development team in a business enterprise must always be at the helm of employing and developing current WordPress technologies and updations. Rigorous specialization in WordPress technical skills will make your WordPress development a success. might not be a taboo subject but typically people don’t speak about such subjects. Development is more good, you do better.